This post is brought to you by Wacom and Her Campus Media. I received the product free of charge. You know what feels really weird? Knowing that I’m not going to have to go back to school this semester. It still hasn’t sunk in that I’m totally done with my Bachelor’s degree! Although, I recently started using a really cool note taking device that almost makes me wish that I were still in school… aaaaalmost. Throughout college, I encountered a ton of professors that didn’t allow laptops or tablets in the classroom. It annoyed me to no end because I can type a hell of a lot faster than I can write. But over the years, whether it was thanks to them or just my own doing, I actually came to prefer handwritten notes, todo lists and planning much more than digital methods. Writing things down on paper helps me remember notes and events much better than just punching them into my phone. The one downfall of handwritten notes, though, is that you have to carry all of them around with you if you want to refer to something later. There’s also no easy way to share handwritten notes or plans unless you spend the time typing them up, or scan them. Plus, when you’re as busy as I am and working on a bunch of different projects at once, paper notes can get overwhelming and disorganized quickly. And that’s where the Bamboo Spark comes in. Where the heck has this been all my life. 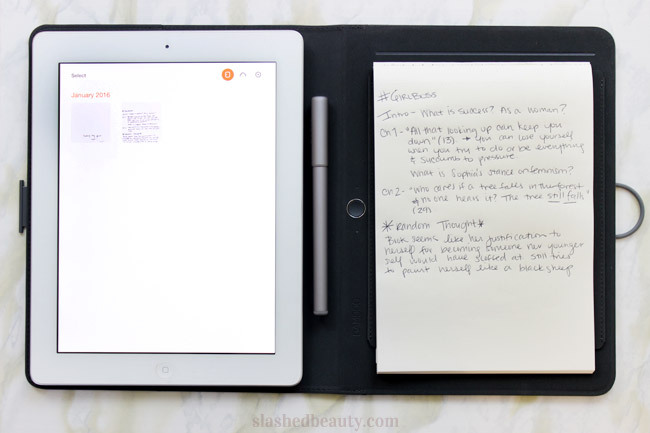 This device will take your handwritten notes, digitize them, and store them in the cloud so you can access them from all your devices. How. Cool. Is. That. The Spark syncs to the cloud via bluetooth through the Bamboo Spark app, but you don’t even need your device with you to take and store notes. Just turn the Spark on and start writing on the included pad of paper or any other paper you have laying around (just make sure it’s placed within the Spark). 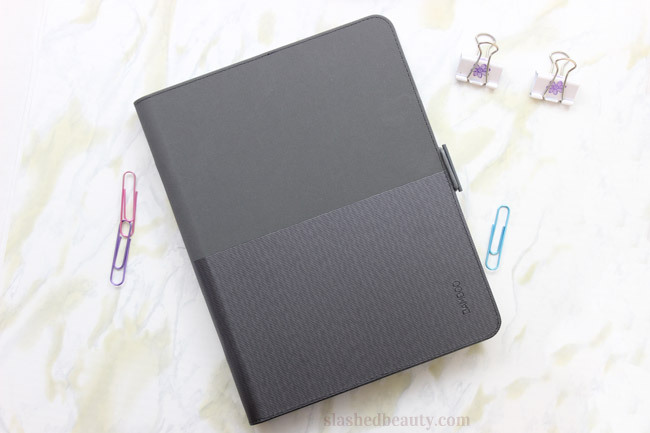 The folio itself can store a ton of pages of notes digitally before the memory is full. When you’re ready to sync, just open the app and the transfer starts automatically. 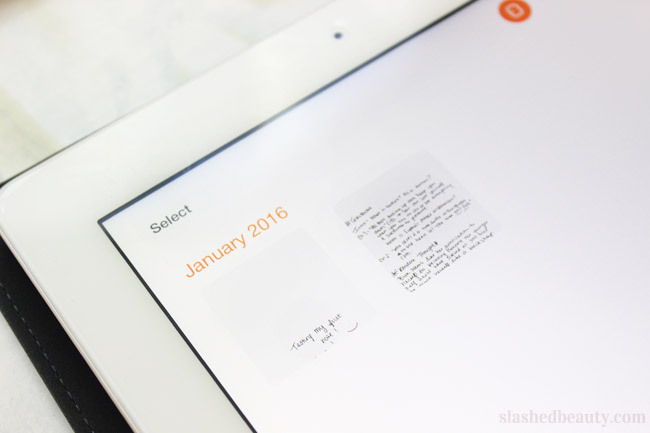 Your library of notes can then be flipped through from your phone or tablet with the app, or from a desktop computer by logging into the cloud. 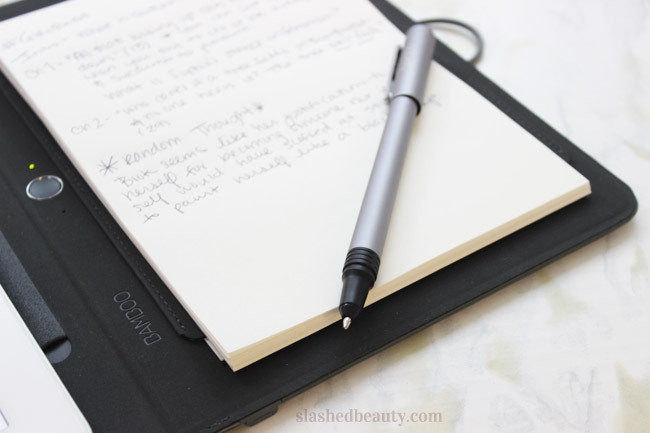 Even though I don’t have to go back to school this month, I’m loving my Bamboo Spark since I’m still taking a ton of handwritten notes and planning projects on paper for work and for my blog. Most recently, I’ve been taking notes about books I’m reading so I can bring them with me to my book club without juggling sheets of paper or sticky notes. I’m also trying to plan a trip to Ireland with my mom this spring, and I’ve been mapping out our itinerary using the spark so I can send her my notes quickly. 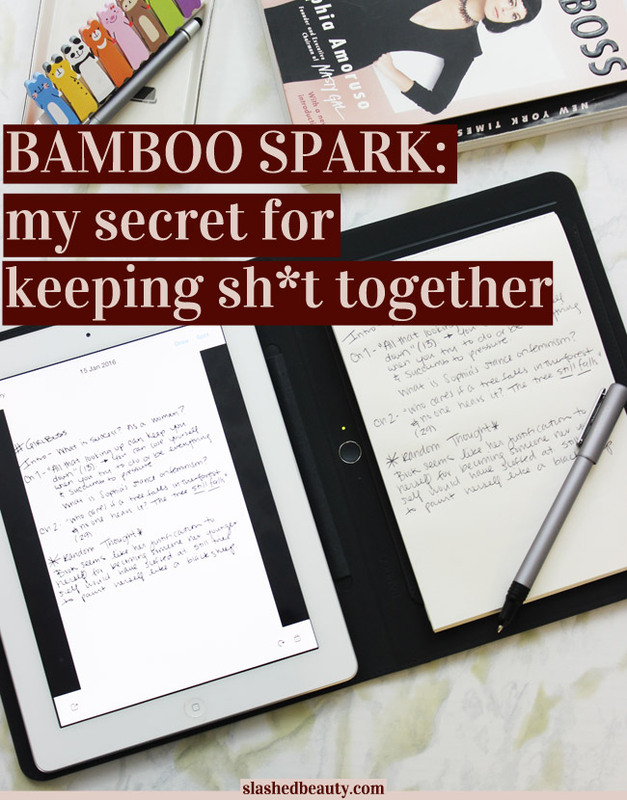 Getting serious about organization is always a New Year’s resolution of mine, so whether you’re going back to school or just need a little help getting more productive this year, I highly recommend the Bamboo Spark. Check out their website to find a retailer near you. How do you get productive with your note taking? My memory is better when I write things down. This is the best of both worlds. I would have loved this while I was in school. I take notes when I am reading books, I write down quotes,page numbers to refer back too, this would be fun to have for that! That’s exactly what I do, and use the spark for! I’m a focus group moderator, and I take notes during my sessions so I can remember what people said to use in writing my report/analysis. I’ve been waiting for something like this. I have a Livescribe pen and bought their “special paper” but the pen needs to be charged so often it wouldn’t last through my sessions. This sounds like something I really need! thanks for reviewing this interesting product! Oh this would be an awesome replacement then! The pen this comes with lasts as long as a normal pen, but the package comes with 2 refills as well.